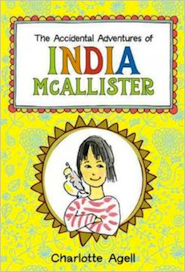 India McAllister hopes that fourth grade brings her plenty of fun and adventures in her small town in Maine. She camps out and looks for UFOs with her friend Colby, tries to catch her father’s new bird that gets loose in the house, and takes walks into the woods with her dog. India is also navigating a number of personal issues, including her parents’ divorce, confusing feelings for her father’s implied boyfriend, embarrassment over a plaster breast that hangs in the living room as a reminder that her mother survived breast cancer, and the fact that she was adopted from China.